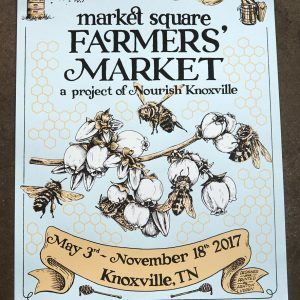 Nourish Knoxville was incorporated in 2013 in order to expand upon the local food work started through the Market Square Farmers’ Market, its vendors, staff, and other projects. The Market Square Farmers’ Market was started on Market Square in 2004 and grew to be one of the top producer-only farmers’ markets in the country. As the market grew, it became apparent that there was no non-profit working on food issues in the Knoxville area. Market director Charlotte Tolley convened a group of local-food loving people to become the first board of directors, and they created Nourish Knoxville to take on projects in the Knoxville food shed beyond the farmers’ markets. 2005: The Wednesday Market Square Farmers’ Market opens, from 4-7pm.